Walter heard about our prison ministry in a miraculous way. About 10 years ago, on the receipt for his Christmas Box from his mother it said, “With love from your friends at St. Nicholas Russian Orthodox Church”! Months later, when he heard the announcement for Father Onouphry’s monthly visit, he came running to see him and find out what Orthodoxy was all about. He was later baptized taking the name Moses, for Moses the Ethiopian. Moses was moved to tears in August when he received a card from us on the first anniversary of his daughter Aundrea’s untimely death. When his fellow inmates asked him what was going on, he told them that “His church family remembered” and took the opportunity to share the hope he has found in the Orthodox Faith. Moses was moved to a prison near Fayetteville and, thanks be to God, found a priest in the area who brings him the sacraments a couple times a year. In addition to losing his daughter, Moses has had several heart attacks. 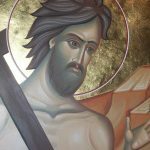 We have participants all over the state and need to connect more priests and Orthodox prison ministries to our friends in prison. Please remember Moses, his mother Clarisse and his grandsons, Avion and Amillio in your prayers for the living and add Aundrea to your personal prayers for the departed.